Two seasons, two flags, two promotions. It’s a script that no one could have imagined, but for Bond University, it’s now a reality. After winning the QAFA (B) South premiership in 2014, and the QAFA (A) premiership this year, the Bull Sharks have been promoted to the QFA South competition for season 2016. The club lodged the request following this year’s premiership, and after meeting all the requirements set out by AFL Queensland, got the green light to step up another grade. 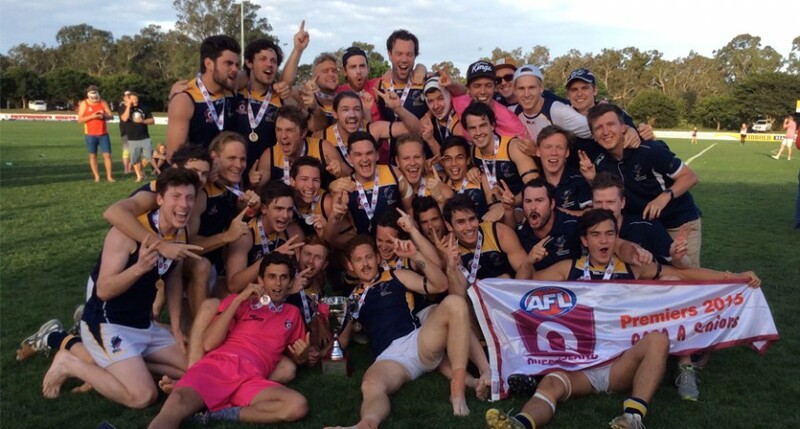 Bond University Football Club President Edward Burrows-Cheng said he never could have imagined a rise like this so quickly. “Absolutely not. A lot of things have changed between now and the first couple of months a few years ago. We got our first real coach, in Sam Wish-Wilson, and that sort of changed a lot of things,” Burrows-Cheng said. The on-field side of things is ticket item number one, but he believes they are well on their way to finding the balance with the off-field aspect as well. “Being a sporting club you want to strive for the on-field performance first and foremost, but then being a uni club we want to represent the interests of the students as well, and try get as many people down and enjoying the sport as we can,” he said. Reaching the QFA level of competition was always a goal of Bond University’s when they were formed, but even they caught themselves by surprise with how quickly it has come about. “I’d definitely say it was an aspiration, and a goal that we had for the medium to long term. For it to happen so quickly is pretty surprising and a bit of a shock, but it was definitely an ambition a lot of people had at the club, to get to this level,” Burrows-Cheng said. With Bond’s QWAFA women’s team going from strength to strength after their first year in the competition, the club’s professionalism is only going to continue to improve next year. “For the guys we will have to change a couple of things around the club and make it that more professional style of football that we have always wanted to do, but now we are required to do as well,” he said. All that they have achieved in the last two years is something that hasn’t fully hasn’t sunk in yet. “When I sit back and talk to the playing group about it, it is an achievement that we can’t even really believe we have been a part of. Some people don’t ever play in a premiership in their whole football career, and some of them are far better players than us,” he said. Don’t think that now they are promoted they have ticked the boxes for 2016. The fire still burns for more success. “I don’t want to jinx it, but let’s just say there are a lot of boys who are very hungry going into this year. There are so many good players in our team who missed out on a flag, and they are hungry to see what we can achieve next year. We will be putting our best foot forward at all stages and seeing what we can do,” Burrows-Cheng said. It’s an early call, but Bond could be the story of 2016. If they get off to a flyer in the first couple of rounds, good luck stopping their momentum.